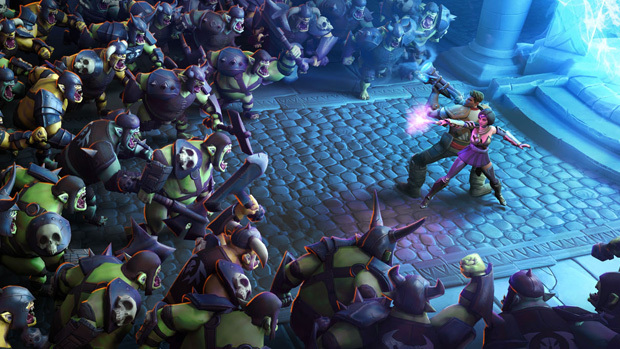 Robot Entertainment has unveiled a special treat in the upcoming Steam release of Orcs Must Die! 2 for fans of the original game. Owners of Orcs Must Die! will find an unlocked "Classic" mode in the sequel. This special cooperative mode features ten of the original title's stages remixed with new enemies. Orcs Must Die! had a fun sense of humor and the gameplay is highly appealing. It sounds as though they're on-track to repeat that in the sequel and I am really looking forward to a little cooperative chaos. Won't be long now. Orcs Must Die! 2 releases on Steam July 30th. Check out a bunch of screenshots of the Classic mode in our gallery.